18 | TH E M R EP O RT FEATURE Marketing to Millennials Understanding this unique generation of homebuyers is essential for achieving loan origination goals. 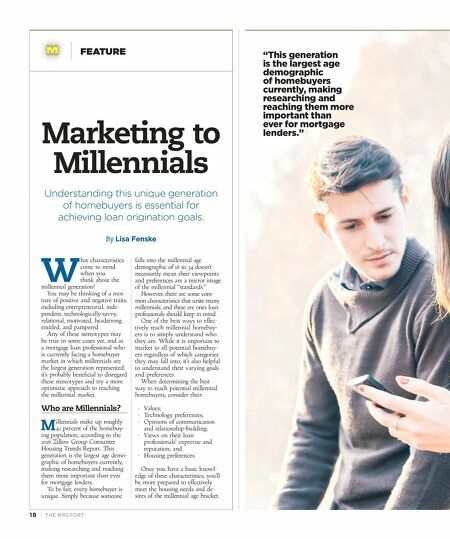 By Lisa Fenske W hat characteristics come to mind when you think about the millennial generation? You may be thinking of a mix- ture of positive and negative traits, including entrepreneurial, inde- pendent, technologically-savvy, relational, motivated, headstrong, entitled, and pampered. Any of these stereotypes may be true in some cases yet, and as a mortgage loan professional who is currently facing a homebuyer market in which millennials are the largest generation represented, it's probably beneficial to disregard these stereotypes and try a more optimistic approach to reaching the millennial market. Who are Millennials? M illennials make up roughly 42 percent of the homebuy- ing population, according to the 2016 Zillow Group Consumer Housing Trends Report. This generation is the largest age demo- graphic of homebuyers currently, making researching and reaching them more important than ever for mortgage lenders. To be fair, every homebuyer is unique. Simply because someone falls into the millennial age demographic of 18 to 34 doesn't necessarily mean their viewpoints and preferences are a mirror image of the millennial "standards." However, there are some com- mon characteristics that unite many millennials, and these are ones loan professionals should keep in mind. One of the best ways to effec - tively reach millennial homebuy- ers is to simply understand who they are. While it is important to market to all potential homebuy- ers regardless of which categories they may fall into, it's also helpful to understand their varying goals and preferences. 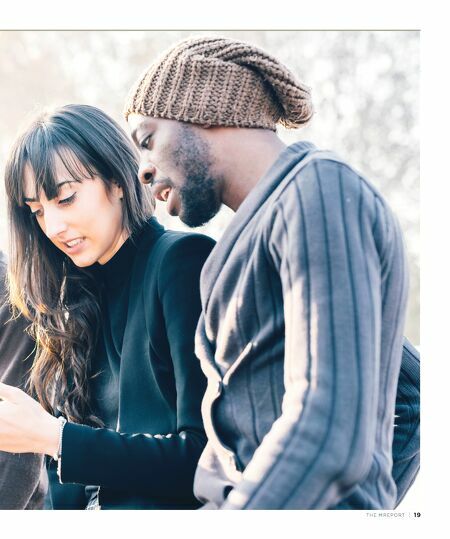 When determining the best way to reach potential millennial homebuyers, consider their: · Values; · Technology preferences; · Opinions of communication and relationship-building; · Views on their loan professionals' expertise and reputation; and · Housing preferences. Once you have a basic knowl- edge of these characteristics, you'll be more prepared to effectively meet the housing needs and de- sires of the millennial age bracket. "This generation is the largest age demographic of homebuyers currently, making researching and reaching them more important than ever for mortgage lenders."